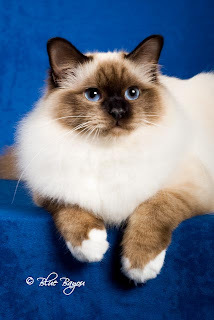 Birman is a beautiful cat breed that originated in Burma. It was first brought to France in 1920 where it was recognized and bred. In the years following the second world war, the cat spread to other nations and was widely bred for its adorable attributes. 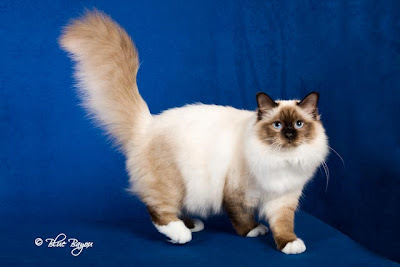 Birman is a somewhat large and well built cat with healthy adult males weighing close to ten to twelve pounds. Females are slightly smaller. Coat of this cute feline is medium in length and silky. It is in a single layer and does not get matted nor require regular grooming. Color is light, varying in shades of golden. Tail is medium in length and bushy. It is tipped by markings, as are legs, ears and face. These markings can be blue, chocolate, cream, lilac, red or seal in color. Face is strong with somewhat heavy set jaws and low set nostrils. Ears are low and wide set and eyes are a dazzling sapphire in appearance. Another pretty feature of the Birman is the color of its four paws. The paws are all white and contrast beautifully against the darker markings on its legs. They appear like gloves and are a source of great attraction even though they seldom are in a perfectly symmetrical pattern. These white gloved paws are a rarity amongst other feline breeds. 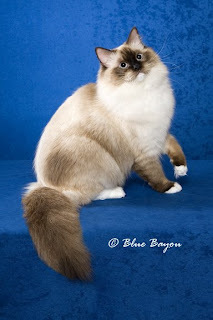 An intelligent and playful cat, Birman is a near perfect companion. It is not very demanding and generally communicates in a soft meow when it is in need of something. It is considered a 'people's cat' and goes quite well with children and even other pets. Inquisitive cats, Birmans are quite fond of exploring every thing in their surroundings. They are quick to develop an affectionate relationship with humans and follow them around, adjusting their schedule to synchronize with that of people. For their sweet and friendly nature, Birmans are much adored by cat owners around the world and make wonderful pets and companions. Looks like a Ragdoll cat to me. The breed is so cute! Thank you for sharing the information about the cat breed.